3D printed, driverless boats could provide taxi and shipping services in river cities. When you’re trapped in traffic behind an impassable garbage truck, or stuck in a horde of taxis swerving in and out of lanes, it’s easy to daydream up a world where you can hop in a hovercraft and avoid the problem altogether. 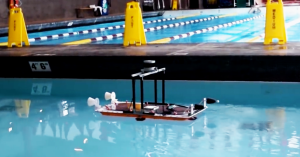 We don’t have that (yet), but would you consider autonomous driverless boats as an alternative? Fleets of self-driving boats cheaply mass-produced by a 3D printer aren’t that far off, according to new research out of MIT. And while self-driving car projects are currently facing hurdles – cities that are hostile to being used as testing grounds, clarification over what it means to be on autopilot, and that self-driving Uber car that killed a pedestrian – the main thing that needs fixing on the boats is adjusting their steering algorithms to better handle strong river currents. These boats could provide a low-cost alternative to street-based taxis or logistical vehicles like garbage trucks. The autonomous vehicles are little more than two-by-four meter rectangles with advanced sensors and processors, not unlike a high-tech version of the makeshift raft that kept Rose alive when the Titanic sank. And if that’s not reassuring, what is? While the boats won’t come with an android to wear a striped shirt and sing to you while piloting your gondola, the team of engineers suggests they could notably reduce city traffic and congestion in places like Venice or Amsterdam, where there are canals and waterways throughout. Given that MIT is right on the edge of the Charles River in Massachusetts (and that driving in Boston is a nightmare), it’s easy to see why the researchers behind this project are so excited. Autonomous boat research isn’t new, but other attempts at a self-driving boat weren’t as sophisticated. These new boats have improved navigation, steering, and docking capabilities, and they can be made on the cheap with relatively low-cost 3D printers. The boats are also built to be interlocking so that when they’re not ferrying people and stuff, they can form together to create water-based structures – like a concert stage or maybe a safer, no-people-required barge for fireworks shows. Presumably, there are fewer pedestrians in the Charles River than there are on the streets of Arizona. Plus, there are likely fewer traffic laws to program into the self-driving boats’ algorithm. But all the same, one of the main problems for engineers to sort out before these boats can hit the surf en masse is how to deal with changes in currents and other conditions like the waves created by larger boats. But once they do, you may find yourself hailing a cab and – instead of a yellow car darting in front of you – a little, driverless rectangle might sail up and whisk you away. Thanks Boaty Mctaxiface.